US political leaders suffer from a "much loved illusion", propagated by the US media, that all countries are converging toward the US model of free market democracy, and are potentially friends, except for a handful of terrorists. Potentially US business executives are making the same errors about trends and risks in the world, according to the authors of a new book. Insights from economics, leadership studies, history, geopolitics and national security are brought together in Masters of Illusion: American Leadership in the Media Age, by D Quinn Mills and Steven Rosenfielde. The book concludes that America has had poor political leadership, and the country has survived and prospered despite rather than because of it. So far, so obvious. Is this also true of the US corporation? The authors say it is. The book projects international alliances and rivalries as they may occur in 2010, 2015 and 2020, and how business leaders should adapt strategies to suit these predictions. The authors found that US policymaking since the Cold War has tended to be based on "wishful thinking and platitudes", a shallow approach that has driven policy behind closed doors in Washington. 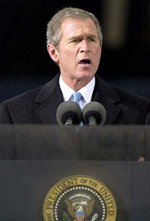 President George W Bush has failed to persuade or convince people to follow his strategy, turning widespread support following the 9/11 attacks into worldwide opposition to the US. "A major failing of current leadership models is the lack of knowledge, awareness, or even interest in life beyond our country's borders, a limitation of growing importance as the global economy expands," say Mills and Rosenfielde. In business, an example is the rarity of foreign executives on company boards. There is a "naïve and self-defeating" assumption that the US model of business governance is ideal, with perhaps a few adjustments, for other countries, and that the job of leaders is to go forth and remake the world in our image. US foreign policy is feeding anti-Americanism across the world and impeding US business in international markets. For example, the growth of negative attitudes toward the US, its brands and products is leading to a fall in the flow of students from Europe to US universities and graduates into US companies. It would pay for US executives to remove rose-tinted spectacles and seek a deeper understanding of international political dynamics. The US mass media bears a lot of responsibility for simplifying stories, demonising enemies and failing to correct misleading stories after they are broadcast. "When the true story emerges the originals are never corrected, particularly on television. One consequence is that our minds contain decades of misinformation that now forms the foundation of faulty decision-making," say the authors. Strategic independence from allies and partners is the most effective US foreign policy, and one that business executives will immediately recognise as the standard corporate approach to strategy in the marketplace. The authors see the biggest threat to the US in coming decades as emerging from strategic rivals rather than non-state actors (i.e. terrorists) - Russia, China, the European Union. The immediate threat over the next decade is from a re-arming Russia, in the decade after 2015 it will be China, while Europe, as it moves toward unification forged in part by anti-Americanism, will become an increasingly aggressive rival. The authors see the threats as including terrorism, WMDs, wars and potential nuclear exchanges. Future US leaders will need to remain vigilant against terrorism; use military power sparingly; avoid large-scale police actions like the occupation of Iraq; reduce the degree to which the US is perceived as a threat to other countries through imposing restraints on US strategic ambitions; and avoid quixotic efforts to remake the world in our own image.